Image: the Ith, from the west. The bedding in this area is not horizontal, but nearly vertical, as the rocks were twisted by tectonic forces. 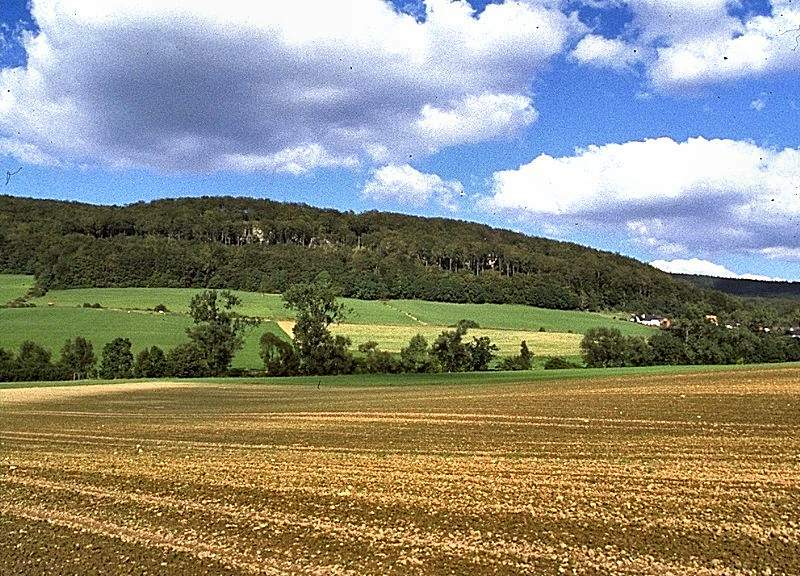 Duinger Berg, Ith and Deister are escarpments, formed by hard limestone layers. Those hard layers resisted erosion better than the softer layers, which form valleys in between. Image: a small cave with an interesting profile. Dimension: L=30m, GR: L=3m, B=3m, H=2m. Bibliography: Die archäologischen Funde aus den Ith-Höhlen. Hrsg: Braunschweigisches Landesmuseum, Abt. Archäologie, Kanzleistr. 3, W-3340 Wolfenbüttel, in Zusammenarbeit mit: Landesmuseum Hannover, Landkeis Holzminden, Roemer- und Pelizaeus-Museum Hildesheim. 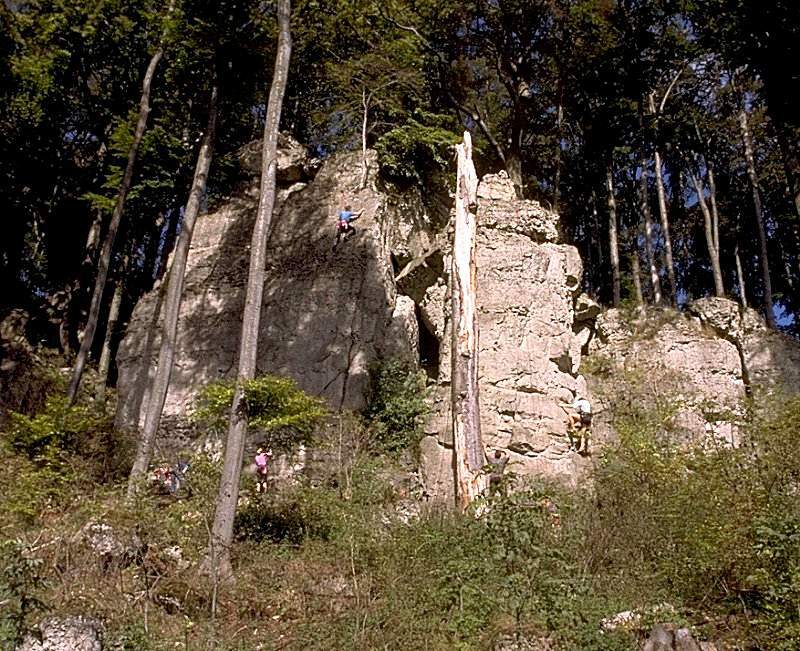 Image: climbing rocks at the Ith, near the town Holzen. 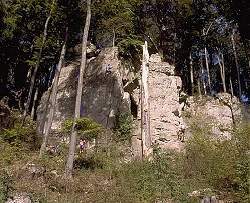 The rocks of the Ith are a well known climbing area. In those rocks a number of small caves and abris, only accessible to climbers, exist. It is difficult to visit them, and the caves are not very impressing. But they are famous for the number of archaeological remains found here. They contained remains from stone age to the middle ages. In German they are called Kulthöhlen (cultic caves). 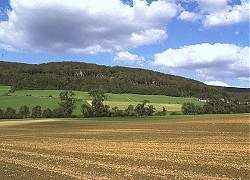 The caves are called Nasensteinhöhle (Nasenstein cave), Rothesteinhöhle (Rothestein cave), Soldatenhöhle (soldiers cave), Töpferhöhle (potter cave), Kinderhöhle (childrens cave) and Teufelsküche (devils kitchen). 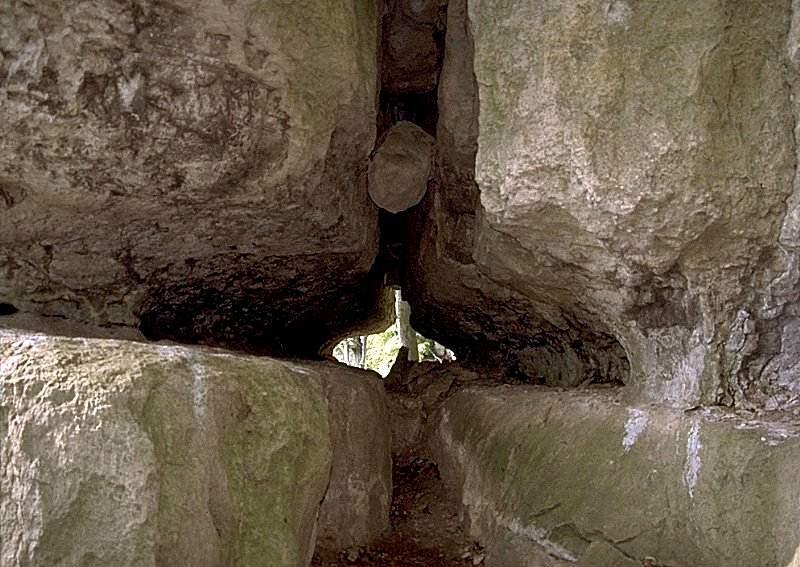 They are typically rather narrow fissure caves, high enough to stand upright inside and rather short. Some are so called abris, shelters. As a visit of the caves is not very impressive, except maybe for climbers, I would recomend the archaeological section of the Braunschweigisches Landesmuseum in Wolfenbüttel. Here the archaeological finds of the caves are on display.